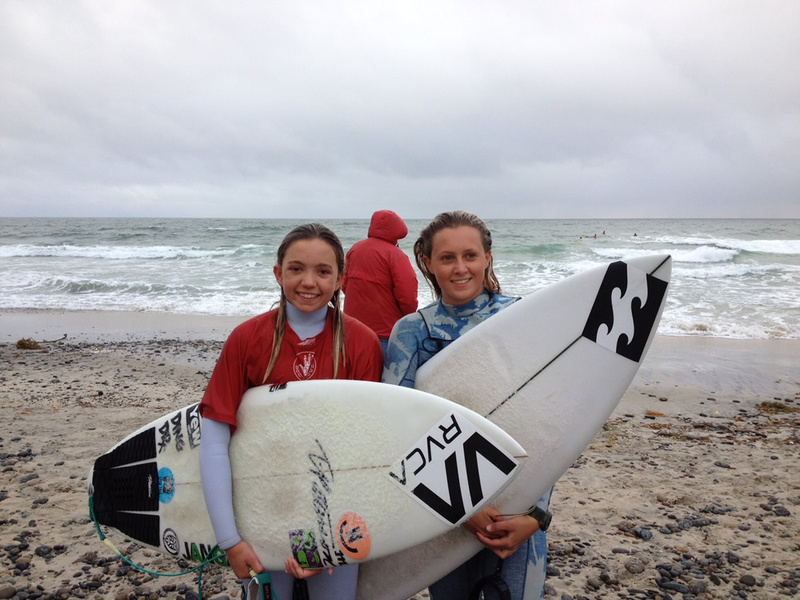 Kalohe Danbara and Kayla Coscino, champions of the Cardiff-by-the-Sea contest. The Laguna Beach High School surfers Kayla Coscino took first and Kalohe Danbara second in the NSSA Interscholastic Regional State Championship on Saturday, March 4, in Cardiff by the Sea. The boys on the team finished fourth among 11 California schools with a total of 86 points. Noah North, Jake Levine and Trey Lockhart all made it to the quarter-final. Travis Booth won his first round to add to the team points, but unfortunately was eliminated by an interference call. Kiko Nelsen, Jeremy Shutts and Dante Madrigal also competed. Contestants took right and left peaks in good surf conditions Saturday, but the Sunday final saw the weather change and wind pick up. “The girls still managed to navigate the conditions really well, getting some high scores to put them out in front!” Coaches Scott Finn and Alisa Cairns said in a statement. The results qualify LBHS to compete in the NSSA High School National Championships, which are held at Salt Creek in June.